← 22 July 2017 Indigo Ruby Tomato. Parsnips are a vegetable seldom on the menu for most people. I grow them and they can get very large. If cooked in an appetizing manner they can be highly desirable even to children. Simply boiled they are blasé. Method. Cut into flat pieces about one inch thick. Steam cook. They cook quickly about five minutes is sufficient. Place in a fry pan using ghee as an oil. Brown lightly on one side. Sprinkle with soy sauce, sprinkle lightly with brown sugar. Place pan in oven under the boiler and brown. Serve alone or as a meal vegetable. 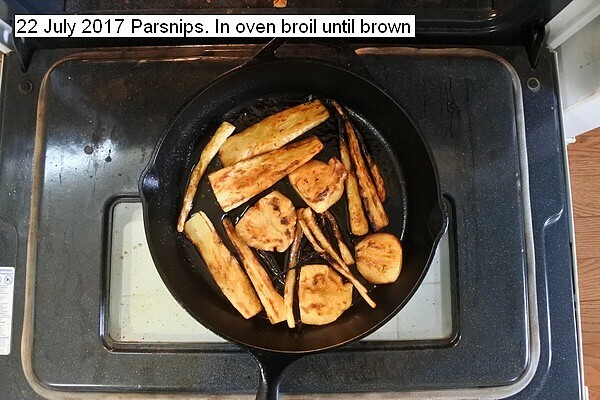 This entry was posted in Uncategorized and tagged 22 July 2017 Parsnips Cooking, Cooking Parsnips, Parsnips Cooking. Bookmark the permalink.